The Danforth Educational Leadership Program at the University of Washington prepares experienced educators to take on prominent school and program-based leadership roles in K-12 school systems. Our innovative competency-based program, combining proven classroom instruction and cutting-edge research with intensive field-based learning experiences, will not only prepare you to be an effective educational leader but also help develop your ability to cultivate leadership in others. Upon successful completion of this program, Danforth students are qualified to apply for the state of Washington's Residency Principal Certificate, Professional Administrator Certificate or both. Danforth students who also wish to earn a UW Master of Education can do so simultaneously with additional classes. The Leadership for Learning (L4L) doctorate in education program (Ed.D.) at the University of Washington is dedicated to producing innovative, equity-focused leaders who have the ability to transform educational systems to help realize ambitious learning goals for all students. The three-year program is designed for professionals currently working in or with K-12 school systems who want to take the next step in their careers. This includes those who wish to become school system superintendents or other district central office leaders, as well as individuals committed to leading schools and other organizations in ways that support high-quality teaching and learning at scale. The conceptual framework for the administrator preparation programs, the Leadership for Learning (L4L) Ed.D. program and Danforth Educational Leadership Program (Danforth) represents our shared vision of and commitment to preparing leaders who deliver on the outcome of equity and excellence for all - the core of our model. Both programs aim to develop leaders who lead from where they are and aspire to positions of broader influence. Our graduates seek to create the conditions needed to realize equity and excellence for each and every student. Our conceptual framework reflects our shared commitment to performance—the extent to which our candidates lead for - and actually realize - deep and sustained results, especially for students traditionally underserved by public school systems. 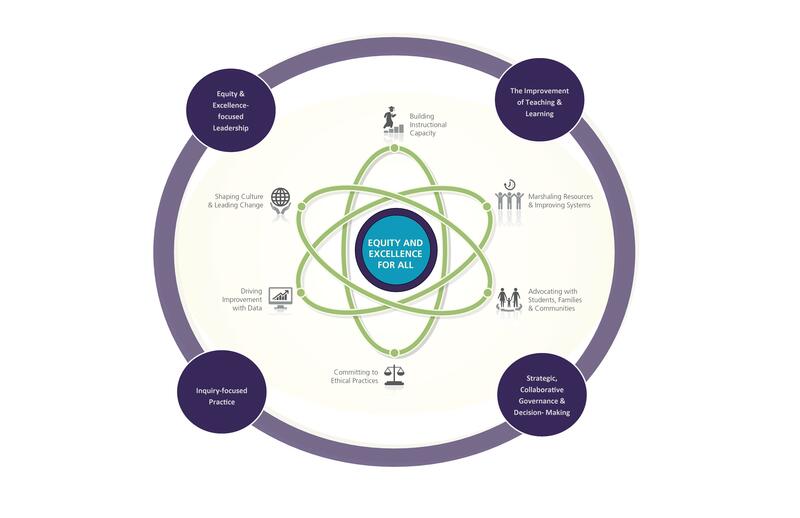 The framework also represents our research- and experience-based view of the nested nature of leadership—that to get to scale with excellent and equitable education for all students, leaders throughout the system must lead in powerful ways that support others in realizing high-quality professional practice. The inner rings of the framework focus on the Danforth program and include: Shaping Culture and Leading Change; Building Instructional Capacity; Marshaling Resources and Improving Systems; Advocating with Students, Families and Communities; Committing to Ethical Practice; and Driving Improvement with Data. These elements indicate the performance outcomes essential to effectively lead within schools in such positions as “principal” and “assistant principal” and to enact effective leadership by district program administrators. Danforth intentionally pushes candidates to move beyond a classroom or department focus to adopt the broader, building level or district unit focus employed by effective principals and program administrators. The outer ring of our conceptual framework includes the broad categories of standards by which we prepare systems-focused leaders in the L4L program. These standards too aim to realize the central goal of equity and excellence for all students. However, they assume that the work of systems-focused leaders is, in part, to support the leadership of educators, such as those prepared by Danforth, who work more proximate to students . The categories our standards address are: Equity and Excellence-focused Leadership; the Improvement of Teaching and Learning; Strategic Collaboration, Governance and Decision-Making; and Inquiry-focused Practice. The theory of action underlying this part of the conceptual framework is that systems get to scale with excellent teaching and learning for all students when leaders throughout the system—including but not exclusively superintendents- take an approach to leadership characterized by our leadership standards in these four categories. The UW Danforth Educational Leadership Program will participate in a $47 million initiative to improve university principal preparation programs supported by the Wallace Foundation. Ann Ishimaru, whose work explores the intersection of leadership, school-community relationships and equity, is the 2016 Jack A. Culbertson Award recipient.